I read The Great Gatsby in high school. I think. I must have, because I remember clearly the green light at the end of the dock, but then I think I must not have, because I do not remember it being sad or melancholy or anything but jazzy and full of parties. Maybe I only read the first few chapters. It's odd how we remember books, isn't it? Regardless, I've read it now. 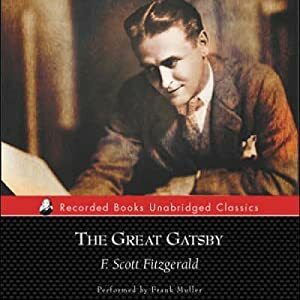 And really, here is little I can say here to add to the body of criticism surrounding Fitzgerald's most known and treasured novel. I can say that it was shorter than I had expected (on audio, it was only about 4 hours long). I can say that it is a striking novel of love and romance and hope and dreams and friendship and betrayal and loneliness and shallowness and money and power and greed and lust. I can say that it walks a fine line between hope and melancholy. Most importantly, I can say that it is powerful and that it is meaningful and that within all of its careful contradictions lies some important idea that all readers should mull over in their own way. As for the audio, I listened to the Record Books edition, narrated by the now-deceased Frank Muller. Muller's voice is near perfect for this novel; he embodies Nick Caraway in the most believable of ways, a narrator at one empassioned and dispassionate. I rarely follow narrators, but I'll be looking for more narrated by Frank Muller. Did you know they are making a movie adaptation of The Great Gatsby , starring Leonardo DiCaprio and Carey Mulligan? Current release is scheduled for November 2012. I didn't know Frank Muller had died. How sad. He is one of favorite narrators. Another favorite is Barbara Rosenblatt. I just love her and do look for books specifically narrated by her. As for TGG. I read it, probably in college. Didn't remember it much. Read it in the last couple of years. Didn't really like it. Probably 1 of 3 people who don't. Oh well. Once upon a time I had a high school English teacher who LOVED this book, and as a result his poor, helpless students were stuck reading, discussing, doing various projects and listening to him rave about it for months. By the time we finally moved on, I absolutely hated the book. I've been thinking of rereading this. It IS very short, and I like that in an audiobook, but I don't like audiobooks for fiction, so I'm torn. I am very skeptical of the upcoming movie. The original movie was dreadful (I mean, if you compare it to the book) and I think they're more likely to try to redo the movie than the book, but diCaprio is usually pretty literary so maybe not.